With the new preliminary decision to implement International bachelors studies for September 2018, the university makes clear it puts its own interest way above that of students. With the new preliminary decision to implement International bachelors studies for September 2018, the university makes clear it puts its own interest way above that of students. Instead of a policy with a precautionary principle, it is implementing improved professionalised marketing, MOOCs and International bachelors simultaneously which could lead to an unsuspected spike in growth. It wants to monitor the growth developments with ‘a internationalisation coordinator’. Such person would only raise a flag when it is already too late, as the WUR would not admit that it couldn’t handle the growth for their reputation. The international bachelors and MOOC’s will push quantity over quality. These two measures are not wrong by themselves, but it will currently result in more problems than benefits with the capacity problems. The Amsterdam university UvA faces large problems as their introduction of international bachelors has more than tripled a number of international students (from 2036 to 6509) in just one year! 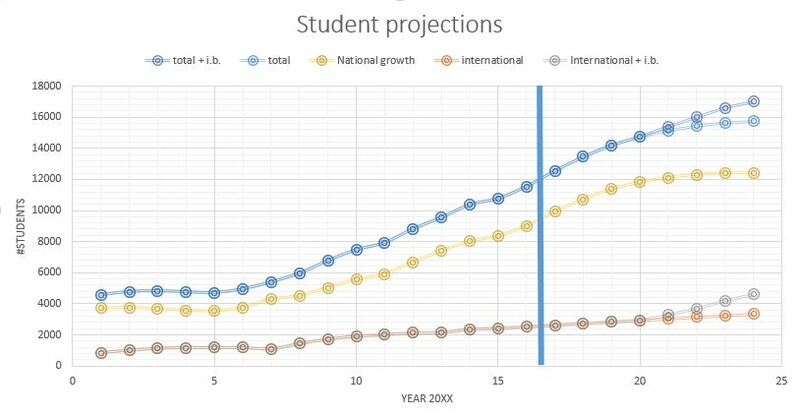 The WUR is just anticipating on 150 additional students on the first year international bachelors and expect 1000 additional students in 2025. An internationalisation coordinator will be hired to prevent unexpected spike growth. But before the coordinator flags it, the problem have already manifested. European regulations will make a quick Numerus Fixus impossible for incoming European students. So international bachelors would mean taking more risk without a fall-back option. Moreover, the university is not passively accommodating students, but it is actively to excessive recruitment. €167.000 euros will be spent yearly on international bachelors and includes fancy travels to foreign fairs, social media campaigns, tailor-made marketing videos and recruiters. This money is not going into education quality or education facilities. The WUR slogan on this issue is to “invest in people instead of stones”, but it is not aware that without enough stones, people in education will drop out. Ironically sometime before the year 2000, the university was on the edge of existence due to too few students. The university of Utrecht showed interest to take over the life science faculty. Some old employees of the WUR might remember it, but it may have an impact on the policymakers of the WUR to never slow down the growth. This fear could explain why the WUR is currently blind for the side-effects of its own success and underestimate the growth rates structurally. That lead to the ridiculous statement that they want to accommodate all growth, but don’t want to invest in decent long term education facilities. The international growth will continue for many more years. Developing countries are moving towards middle-income countries, where a substantial part of the population has the possibility to study abroad. The WUR is popular and makes a smart move by investing heavily in MOOC’s (Massive Open Online Course). 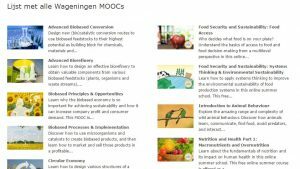 Thousands of students get in contact with online WUR education and will decide to follow their complete master or bachelor in Wageningen. 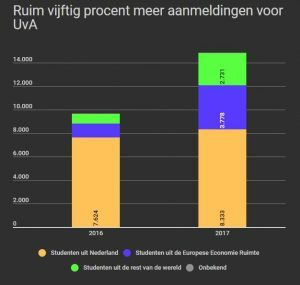 Considering the national students, the WUR doesn’t expect any growth, as a number of youngsters born in the Netherlands and following pre-university school will stabilise or decline. Demographically they are correct, but they neglect the social and political dimension in the choice of youngsters and society. Regarding the growth of ‘Groenlinks’, the Paris agreement and the Climate-KIC program, studies in life sciences are no longer niches but are becoming mainstream. 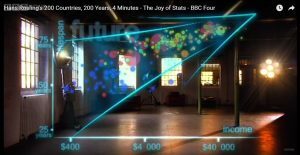 Lastly, the fear of digital disruption that makes everybody an university(s)hopper, who will learn everything from the television in their smart home, is overrated for the short term. Smartphones and Augmented Reality haven’t revolutionised education yet, as it hasn’t changed the way we learn. Our current communication technology doesn’t perform equally to explain and discuss complex knowledge and nuances compared with face-to-face conversation. Last month demissionary-minister Dijsselbloem, minister of finance, and Louise Fresco announced that more than two million euros will go to a ‘dialogue centre’ and a ‘starter village’, but nothing is said about financing what is needed the most: additional education facilities. Hopefully, the elections have opened the door to a new minister who will announce proper funding. In the other case, the board of the university can call upon us for enhancing the dialogue: Twilight lectures is no solution.